The Monju fast-breeder nuclear reactor in central Japan is the latest to join the long line of failed attempts to prove breeder technology. 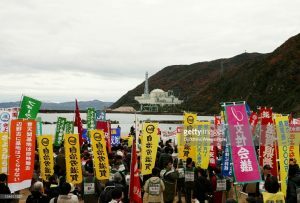 Even though Monju has been largely shutdown since a bad accident in 1995, proponents of the “sodium cooled” technology still promised miracles like perpetual power generated by producing more reactor fuel than was used. Monju limped along in cold shutdown after the accident, until 2018 when Japan’s Nuclear Regulation Authority put the final nail in its coffin and approved a plan for decommissioning—just like similar dead-end projects in the US, UK, Germany and France. One headline in Nikkei Asian Review read, “Japan to shut troubled ‘dream’ nuclear reactor: The decades-old plant cost almost $10 billion and hardly ever operated.” It operated only 250 days in the 14 years since its 1994 start up. Japan expects to spend over $3.5 billion to decommission the giant machines which it estimates will take 30 years, (four years just to remove its 530 fuel rods) and engineers estimate the process will create 26,700 tons of radioactive waste. There is no process yet designated for removal of the 760 tons of radioactive liquid sodium coolant. The operators still have no licensed and approved destination for the high-level waste fuel rods, beyond placing them in an onsite cooling pool. The theory behind breeder reactors was to produce more fuel than they use. Liquid Metal Fast Breeder Reactors like Monju were to use plutonium fuel rods to produce more plutonium. Most breeder experiments, such as Monju, are cooled by liquid sodium, the “liquid metal,” an extremely dangerous chemical that ignites on contact with air and explodes on contact with water. The designers aspired to create a “plutonium economy” to make nuclear power viable long after the supply of uranium was depleted. Another breeder pipe dream was that the reactors would reduce the volume of solid radioactive waste by extracting plutonium from waste uranium fuel rods and turning it into fuel. The Achilles heel in this plan is its generation of huge volumes of liquid high-level waste. Even after 60 years and tens of billions of dollars invested, not a single breeder reactor experiment has succeeded. “Despite its theoretical attractiveness in converting non-fissile into fissile material, the breeder reactor has turned out to be a far tougher technology than thermal reactors. Unfortunately the dream of breeder reactors has remained a theory. The magic of fuel multiplication has not yet been realized on any meaningful scale.” This assessment, written nearly 20 years ago by Arjun Makhijani and Scott Saleska in The Nuclear Power Deception, has been confirmed over and over again. Nevertheless, Russia, India and China continue to invest in the concept.